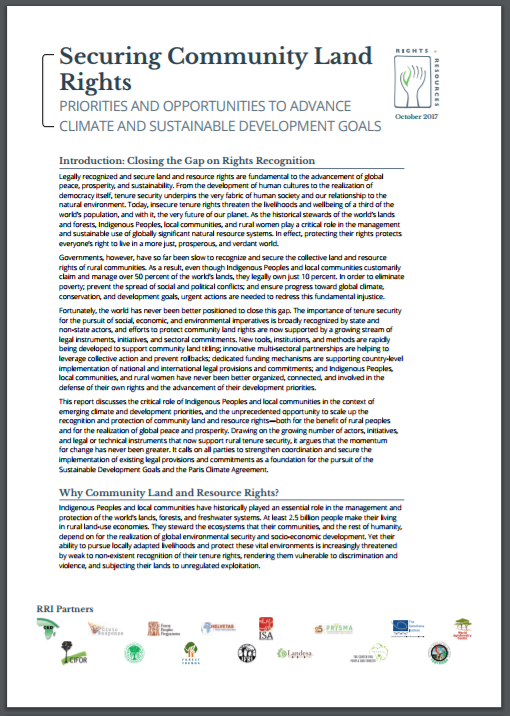 Legally recognized and secure land and resource rights are fundamental to the advancement of global peace, prosperity, and sustainability. From the development of human cultures to the realization of democracy itself, tenure security underpins the very fabric of human society and our relationship to the natural environment. Today, insecure tenure rights threaten the livelihoods and wellbeing of a third of the world’s population, and with it, the very future of our planet. As the historical stewards of the world’s lands and forests, Indigenous Peoples, local communities, and rural women play a critical role in the management and sustainable use of globally significant natural resource systems. In effect, protecting their rights protects everyone’s right to live in a more just, prosperous, and verdant world. Governments, however, have so far been slow to recognize and secure the collective land and resource rights of rural communities. As a result, even though Indigenous Peoples and local communities customarily claim and manage over 50 percent of the world’s lands, they legally own just 10 percent. In order to eliminate poverty; prevent the spread of social and political conflicts; and ensure progress toward global climate, conservation, and development goals, urgent actions are needed to redress this fundamental injustice. Fortunately, the world has never been better positioned to close this gap.